SMITHFIELD, Va., Jun. 15 /CSRwire/ - Today, Smithfield Foods, Inc. released new, more comprehensive information about its industry-leading animal care initiatives in the first installment of its 2015 Sustainability and Financial Report. Starting with its Animal Care section, Smithfield will issue its 15th annual report in segments over an eight-week period. New to this year’s report, Smithfield provides a clear, practical explanation and specific examples of ‘prevention’ as related to antibiotics use in farm animals. At Smithfield, preventative antibiotics are used solely to reduce disease carriers in its herd and to prevent animals from contracting a disease, which would then require additional treatment and potentially more antibiotics. Advancing the company’s well-recognized position as a leader in animal care, the report also features new details about the company’s animal care audit platform designed to provide customers and consumers with greater assurance that Smithfield is doing its part to raise animals in a responsible way. Additional highlights include a case study illustrating how Smithfield created a new market for sustainable feed, new details about the company’s breeding program, updates about the company’s conversion to sow group housing and other company initiatives that improve animal well-being. First and only company in the industry to report antibiotics usage since 2007. First to commit to providing group housing for pregnant sows on company-owned and contract farms. First pork producer to develop and implement comprehensive, systematic animal welfare management program to monitor and measure animal well-being. Ended use of medically important antibiotics for growth promotion on company-owned and contract farms. Removed ractopamine from feed for all company-owned animals supplied to processing facilities. 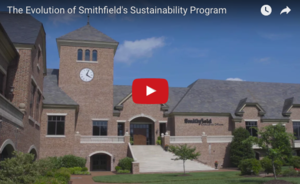 For the first time, Smithfield will issue its annual sustainability report in segments organized by pillar of the company’s robust program. The goal is to better engage a broad range of stakeholders by delivering information in a more accessible way. Following the Animal Care section, Smithfield will publish its Environment, Food Safety and Quality, Helping Communities and People segments in succession. The full report will be available in mid-August. The Animal Care section of Smithfield’s 2015 Sustainability and Financial Report is now available at smithfieldfoods.com/animalcare. Smithfield Foods is a $14 billion global food company and the world's largest pork processor and hog producer. In the United States, the company is also the leader in numerous packaged meats categories with popular brands including Smithfield®, Eckrich®, Farmland®, Nathan's Famous®, Armour®, Cook's®, John Morrell®, Gwaltney®, Kretschmar®, Margherita®, Curly's®, Carando® and Healthy Ones®. Smithfield Foods is committed to providing good food in a responsible way and maintains robust animal care, community involvement, employee safety, environmental and food safety and quality programs. For more information, visit www.smithfieldfoods.com.